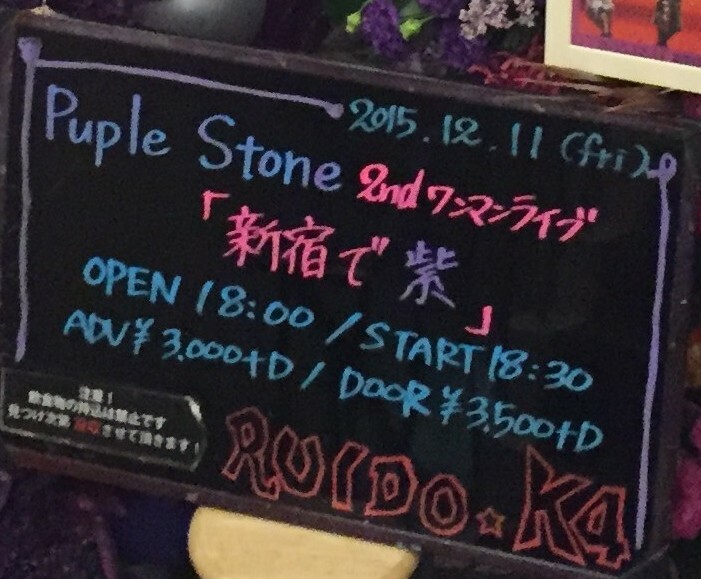 11th December 2015 was the date of Purple Stone’s 1st Oneman Live in Tokyo. With their broad repertoire of music, ranging from ballads to heavy rock, electro to Japanese-style, what did they have in store for us? The venue was already awash with the purple glow of violet wristbands before the opening of Purple Stone’s 2nd Oneman as the fans distributed the bracelets to every single person present. 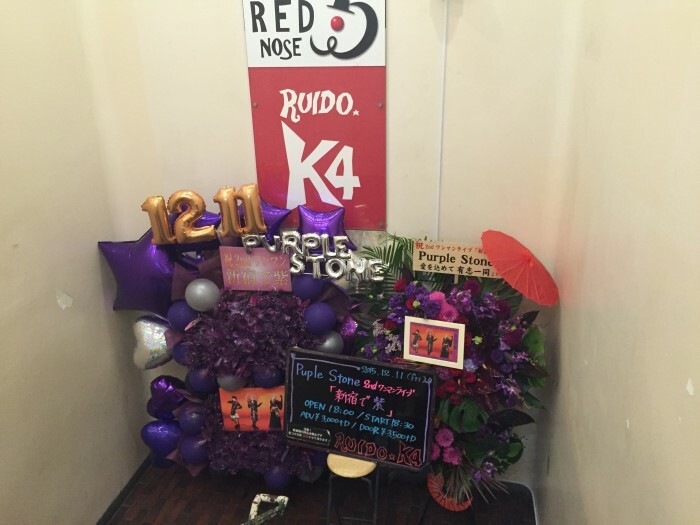 Already you could feel the camaraderie of Purple Stone’s fans, promising an exciting night ahead. Purple Stone’s new SE began, an oriental mix of gongs and guitar, and as the mist and red light began to burn. Suddenly the music paused and a voice declared ‘It’s showtime!’. Abruptly, the clapping began, as the fans waited for the band to appear on stage. Here and there, the bright LED rings glittered in the haze like fireflies, as the red lights turned to green strobes, psyching the crowd for the appearance of the band. Fuma was the first out in Purple Stone’s new Asian-style outfits, and he leapt onto the box to check out the venue. As their support drummer, Spica, took his position, Gak sauntered on, pausing briefly to greet the crowds with an upraised arm. Keiya left a little pause before striding out, to the calls of all of Purple Stone’s fans. He leapt onto the vocalist’s box as the fans lifted their arms, greeting him in the venue. With little ado, the Japanese style music of Kaiten Mokuba resounded out and the fans immediately went into a round of furious headbanging. In one motion, they all paused as the music faded out to a quiet lull as Keiya’s voice alone rang out across the hall. He crouched on his box as Gak and Fuma played stolidly, only his eyes roaming, drinking in the view from the stage at the packed venue. The scarlet lights and band went unnaturally still, before, with a cry, the rainbow lights erupted and the fans began to jump to the increased pace of the high point of the song. Once more, the song became quieter, with Keiya’s strong voice encouraging the fans to forget time as Gak and Fuma mouthed the words with him, both playing passionately, stances low and solid. Suddenly the drums and bass upped their intensity until you could feel it in your bones and the fans reacted with synchronized oritatami. Gak then stepped forward for a brief guitar solo, Keiya spinning down from the vocalist’s box as the fans raised their arms for Purple Stone’s elegant guitarist. Keiya’s voice rejoined Gak’s guitar and Spica started drumming once more as the fans made hearts with their hands for Keiya and the song erupted into its final stage. Fuma played zealously, his scarlet extensions flashing like the strobes until the song wound down. Keiya paused upon his box to survey the Tokyo turnout as they went straight into a Purple Stone live classic, Scar. ‘Saa, let’s go, Tokyo!’ Keiya called, his voice rougher as his channeled the rock beat of the drums and the more intense riffs of Scar. ‘Bring it!’ He drew himself up and threw an arm out to the crowd, commanding them to headbang. In a single motion, all fans obliged, giving it their all as Keiya ad-libbed a long, piercing note into the microphone. At once, all the members burst into a flurry of activity, a juxtaposition to the relatively calm Kaiten Mokuba. Fuma and Gak tossed their hair as the strobes pulsed to the heavier sound of Scar. After a round of punching the air, Gak directed the mosh with his guitar and Fuma mouthed the words under his breath, watching the crowds as they stopped and fell into a round of headbanging during a lull in Keiya’s lyrics. Gak’s fingers flew in a busy solo riff, before the red strobes broke through the atmosphere, sending the fans into a quick mosh. The enthusiastic crowds were only riled more as Keiya added in two impulsive adlibs, accompanied by Gak adding a slide of notes on his guitar. The crowd-pleasing song ended with Keiya shooting out into the crowd with his microphone and asking for their voices. During the MC, Keiya thanked the audience for coming, explaining how important this first Tokyo oneman was important to them, one of their heart’s desires. He had been worried about how it would turn out, but thanks to the passion and love the audience were showing them, he was no longer afraid. He acknowledged that lots of different people had come to see them, perhaps even for the first time, and told the fans to involve everyone and make it a night to remember. Then, with little embellishment, he raised his voice and told the crowds ‘Let’s go! Let’s burn brightly tonight!’ and launched straight into the kira-kira Aoiyami. In a complete turnaround from Scar, Aoiyami offered some lightheartedness to the sincerity of Keiya’s MC, opening with a fast riff and flashing blue lights. The fans began to punch the air, Keiya joining them, their rings adding more glitz and glitter to the dark live house. Everyone quietened as Keiya sung gently about an empty night’s sky in which you couldn’t even see the moon, and then the music leapt back into play, Keiya singing about continuing to run on, putting his heart into the lyrics that highlight the drive of Purple Stone. Gak watched the crowd over one shoulder as he played, Keiya spinning off his box into a classic Keiya pose, mic held high, head tipped back, silhouetted by the lights. 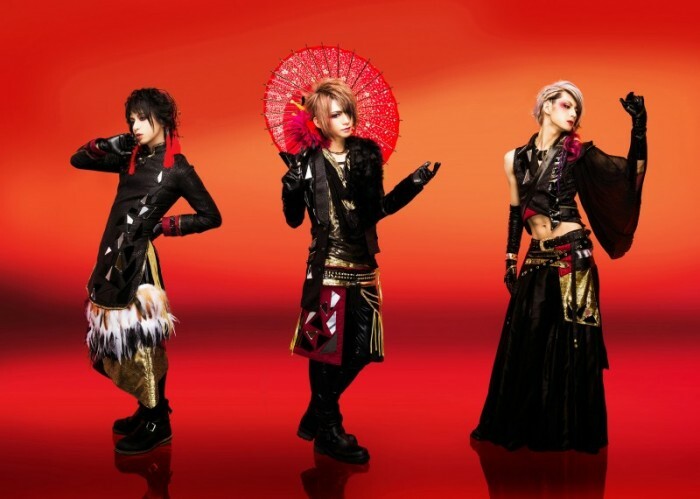 Every moment is a performance in Visual Kei, and Purple Stone do nothing but deliver. Keiya burst into a round of rap as Fuma leant over the bars, encouraging shouts from the crowds, beaming all the while. Then came an iconic image – the three members moving unconsciously to stand in line, all singing along to the track as they surveyed the floor, before Keiya knelt on his box, head bowed, starting a round of clapping with his hands over his head as Gak’s riff rang out. Then Keiya was on his feet with an imperious ‘Come!’, his arms thrown wide, inviting the fans to start oritatami with fervor. After a Gak solo and a high, long ad-lib by Keiya, the only sound left was the guitar, resounding out as Gak played furiously, until it, too died, to be replaced by Keiya quietly whispering ‘thank-you’ into the mic. Next up was the coupling song to Aoiyami, Light Blue. Keiya gave a shout and the fans surged into a round of punching the air. Light Blue reclaimed the rock tone of the night, as the lights flashed quickly, blue and green in quick succession. Fuma tossed his extensions to the beat, the quiet charming intensity to the confident showmanship of Keiya and the glamour of Gak. Keiya knelt on his box, reaching out to the crowds as the drums pealed through the air, faster. Gak chased a series of notes up his guitar as Fuma smiled to the fans, his bass line reverberating through the floor. The blue lights silhouetted Keiya as he told the crowd ‘Let’s go!’ and the fans reacted with elegant sensu, the green lights and bouncy beat providing a disconcertingly bright note to the drama that was about to follow by the way of Hysteric Lady. The lights fell dark, and a slow scarlet glow began to seep through the air as the interlude began, a steady roll of wave-like sounds, a tension that recalled nothing but the fluttering of unseen creatures in the dark, the pressure you feel before the jump scare in a horror movie. The lights undulated like the passing of shadows just out of sight, and the tension rose and rose, a tightening in the chest, reaching a peak before falling into the iconic synthesized opening of Hysteric Lady. Keiya immediately reacted with a deep growl, ‘Use your heads! Bring it on!’ and gestured out to the crowds, as Gak clapped to the beat above his head as the green strobes played, and the drums kicked in, sending the crowds into oritatami for the first stage of the melodic Hysteric Lady. Gak and Fuma shouted into the microphones with the chorus, providing the timing for the fans to jump into the air with the guitar and drums, as the strobes flashed through hundreds of colours, turning the livehouse into a nightclub. At the peak, Keiya held a long, long note before spinning down off of his box in one smooth motion to allow Fuma to draw closer to the front as he played, his fingers flying. All three once again showed their support for each other, swaying exactly in time with the beat, before riling the crowd with united shouts of ‘hey! Hey!’ before the oritatami began once more and Keiya praised the fans for their efforts. As the fans continued to headbang vehemently, Keiya held the final note of the song for a good five seconds or more, before murmuring ‘thank-you very much’ out to the audience as Gak finished up his riff to wind down for the next MC. As they waited for Fuma’s tuning, Gak riled the crowd with some choice note slides, and the crowds responded, calling the members names until Keiya was ready to start the MC. He thanked them for coming again and passed the role to Fuma who mentioned how the weather had been poor since early morning, but it had finally brightened up in the afternoon, an omen for the night. They encouraged everyone to watch the new videos for the live choreography online before Keiya leapt back up onto his box, his gentle personality replaced by the confident showman and he let out a death shout, his voice rougher than in the songs, telling the crowd to let go of everything and just have fun. The new Adrenaline Bang! was jazzy and upbeat, perfect for preventing the crowds from entering a comfortable lull after the MC. Everyone started to clap, and the lights began to blaze out red and yellow like a carnival. Keiya called for a mosh and the fans leapt into action, a single rolling wave of movement. Keiya directed the mosh from his box as the bass and guitar shook the floor. For this song, Keiya’s mellow voice changed pitch, projecting higher and faster. The headbanging began with Keiya’s call of ‘Bring it, Tokyo!’ before everyone made hearts with their hands in time to Spica’s drums. The cymbals pealed out in a unique rhythm, upbeat and jazzy, before the bass drum kicked in after the mosh, providing a juxtaposition to Keiya’s voice as the lights flashed red and yellow, broken by periods of darkness as the instruments fell silent for the briefest of moments in repetition to allow Keiya’s voice to soar undisturbed through the haze of the live house. Then Keiya paused, arms spread wide, looked the crowd in the eye and with a ‘3, 2, 1’ made the crowds burst into a flurry of headbanging. The headbanging paused for everyone to clap to the jazzy tune, Fuma stepping up to the bars to gaze out over the crowds, clapping over his head. Keiya asked the crowds if they had more and the dance tune returned full force. As it began to wind down, all of the members of Purple Stone were unable to stop smiling as they watched the fans react to the addictive beat of Adrenaline Bang! Once more they paused for an MC in which Keiya gave a heartfelt speech about reflecting back upon the time he had been ill and away from Purple Stone nearly two years before. Originally, they’d always done lives with few fans in Tokyo and yet they’d managed to create something beautiful since then. He mentioned that Purple Stone had always felt different to him from the other bands he’d been in and that he was so grateful to all the fans that turned up to see them, old or new, close or far. He said that he only stood on stage to convey all his emotion and to deliver for the people that came to see them. When he had been ill, it had been a dark and scary time in his life, and the following song was an amalgamation of all those fears. To him, Esoragoto is Purple Stone’s most beautiful song, and he was glad that he could sing it again. The darkness fell as the power ballad Esoragoto began, its emphasis on its lyrics and the raw emotion that drove its creation. The drums and the guitar created not a soft, flowing ballad, but a ballad with a whole heart-full of emotion and heartache behind it. Keiya prepared through the mist that drifted through the darkness of the livehouse, squaring his shoulders in preparation for the emotion that followed. At first, there was just the drums and his voice, drifting across the venue, before the guitar and bass burst in, as Keiya implored the listener not to leave him alone and that he couldn’t see an end to it all. At the high point of the song, he sprang onto his box for the first time, breaking his own stillness, and sang to the fans, ‘if a reason to live is necessary, then please let me have a reason’. He then paused, drawing himself up, hand on his heart, eyes closed as the instruments played their passion out across the venue. All members played with emotion. Spica’s drums were filled with the fury of fear, and Fuma played lower, his stance solid, anchoring himself against the pain in the lyrics. Gak played intensely, his arm swinging with every note, expressing the passion that Keiya was conveying with his lyrics. The lights themselves were also simple, leaving nothing but the music. Keiya rounded off the song, his last adlib soaring out across the motionless audience, as the lights rendered him a silhouette. The emotional ballad faded out into a thoughtful darkness, as Keiya’s quiet, whispered ‘thank-you’ dispersed with the mist. After a pause, allowing the fans to rein in their emotions, the upbeat but melodic Dokoka Tooku he kicked in and Keiya invited the crowds to headbang as the white strobes shattered the darkness and somber aftereffect of the emotionally intense Esoragoto.. Keiya started to dance as the fans clapped to the fast beat, as if to reassure them the hard times were over and there was nothing but fun left. Gak played in a wide, relaxed stance, his body laidback. Fuma stood more casually, singing to the the track, before dropping into a lower stance and playing with vehemence, his whole body moving with the music. The words ‘I wanna get away…’ lingered in the air even as Keiya told the crowds ‘let’s go’ and joined them in a round of headbanging. He then leapt from his box to go and lean against Fuma who smiled back at him before Keiya spun away across stage to direct the choreography, left, right, and up with elegant arm motions. The instruments burst into a heavier tune as Keiya waited on the box for his rap, the drums vibrating through the air. Then a slower rendition of the chorus began, a welcome lull in the intense song, Keiya silhouetted by white lights, and the drums throbbed through your bones like a second heart. Then the headbanging began for the final stage of the song, and Keiya leaned on the bar above him, watching everyone become one body, drinking in the camaraderie of the fans. Fuma stood poised as a waiting cat on his right, watching with the same intensity as Gak pointed out to the audience on Keiya’s right, rounding off the song with the final notes of guitar. Suddenly, music like a heart beating began to pulse through the live house. The strobes kicked in, whirling across the faces of the fans, once again promising a dance tune. Gak and Fuma paced forward to clap above their heads, leading the crowds as the electro beat matched the pulsating of the lights. It was upbeat, energetic, wholly enjoyable, the entire composition encouraging the fans to let go and dance; which Gak indulged in, throwing his arms up into the air, eyes flashing. Fuma leant out over the bars, still clapping, riling the fans with his proximity, joining them in their delight. Keiya leapt up onto his box and began to call ‘Oi, oi, oi, oi!’, and the fans responded likewise, their voices filling the venue. Keiya teased them with an ‘I can’t hear you! !’, convincing the audience to lean forward as they called back at him punching their air with their fists. Gak and Fuma joined Keiya in the shouts, waiting for the response of the crowds with brilliant smiles. Everyone jumped and danced as the disco began with Paradise Dance. The three band members unconsciously bunched together as the fans danced, then broke away calling for Tokyo to bring it all. ‘Let’s jump! Go, go, go!’ Keiya shouted and, in one beat, together with the drums, everyone started to jump in time, including the band themselves. Nothing gave the atmosphere of the live such a united front as this dance track as Keiya sang that he wanted to dance, and the crowd followed, giving into the allure of the strobe lighting and the infectious beat to abandon it all and enjoy. Then music had been amped up in volume so it filled every pore, until it suddenly cut to allow the strength of Keiya’s voice to be heard undisturbed, before returning full blast with the instruments. Gak and Fuma danced relentlessly to the beat, losing themselves to the music as much as the fans. The whole building moved with the dancing of the crowd and the jazz beat riled them into a round of clapping and the lights continued to whirl in dizzying patterns. The oritatami began once more when Keiya threw his arms wide in a silent command as the beat changed pace, standing up on his box like a king. He hit a high falsetto as the music paused. Gak took the silence as an opportunity to willow back, holding his guitar up in salute, bending nearly in half before snapping up dramatically with the drums booming back into action. Fuma couldn’t help but smile as he played, and Keiya continued to rile the crowds until the end, telling them to jump and jump. Without much of a lull, the jazzy dance tune of Paradise Dance ended, falling into the unique opening of Amazuppai Mango. The lights turned scarlet as the underlying bass was heard strongly through the other instruments. Keiya asked for the crowd to give him their voices and they burst into furious punching of the air. With the chorus, the sensu choreography began and Keiya leapt into the air, spinning down off of his box. Gak joined him in a quick whirl as Fuma set his legs, playing with intensity. The beat shifted to jumping before returning to the flashing orange lights of the chorus. During the oritatami, Keiya discarded his mic in favour of singing without one, and his powerful voice was still audible from the back of the venue, not missing a single note even under the strain of projecting so far. The fans sang back at him, and the song wound down into the final interval, singling another change of pace, this time for the heavy rock side of Purple Stone. The drums began to pound in a tribal rhythm, and Keiya riled the crowd with a call and response shouting match to pulsating red lights. Fuma beamed out as the fans responded wholeheartedly, their voices rebounding from the walls. He accepted the mic from Keiya and began his own call and response, laughing in between the shouts, his enjoyment tangible. Keiya bounded over to Gak after Fuma’s turn, and Gak took the mic, moving to the front to wait for eyes to turn to him. He roared out, his death voice raising the tension in the room as he slung his guitar on his back to free his arm for punching the air as punctuation. Then the headbanging began. Gak threw himself into it, as did Fuma, whilst Keiya hung onto the ceiling bar, watching the roiling sea before him. With a quiet ‘Can you do it?’, Keiya launched the heavy Forgery. The violence of the strobes matched the intensity of the fans punching the air as Keiya growled into the mic, before they returned to synchronized oritatami. Keiya crouched on his box as he called ‘You can’t take my soul away from me’, the furious, determined emotions behind this song pealing out through the heavy beat of the drums and the rage of the guitar and bass. Keiya and Gak were doubled over as they performed, so absorbed in the song were they, and Fuma’s stance was solid, braced like a sailor against a storm. Keiya’s voice went rougher as he hit a high note in the middle of the mist and glowing crimson lights. He began to shout about lies and death as the fans matched his intensity with their fists. In the final peak of the tension to this violent song, he reared back and let out a ringing, eerie laugh. Keiya fell silent, crouched almost invisible on his box as the headbanging lasted and lasted, the drums and guitar and bass building and building, the tension growing higher and higher, until Keiya hit one final note. Then he called for the final song, telling the audience to grab their towels for Purple Stone’s classic live song, Blame. The blue and yellow lights wove between the whirling of the audience’s towels as the more upbeat, lighthearted Blame began. The fans clapped before beginning oritatami during Keiya’s rap, Gak punching the sky as Keiya sang ‘hey! Hey!’. The busy activity of Blame only continues as the fans spun their towels at Keiya’s request and then turned to periods of jumping to Keiya’s lyrics. Keiya acknowledged the physical intensity of Blame by asking the audience if they could still keep going and to start a mosh. The audience responded beautifully, moshing to the swift strobe lights. Gak went to sit on the central box, leaving space for Keiya to climb up to the speakers to survey the audience from up high. Fuma leapt into the space vacated by Gak to direct the mosh with his bass and hands, playing the crowds like a puppeteer. Keiya praised the crowds on their mosh before the lights dimmed and the song slowed. ‘I feel, it’s wrong… woah-oh. My blame!’ Keiya’s final sentence rang out, the last note lasting and lasting until he launched into a heartfelt adlib as the crowds continued to spin their towels frantically to the beat of the drums and guitar. Keiya thanked the crowds as the lights fell into nothing but a steady glow. With a final ‘We were Purple Stone!’ the band filtered from the stage with little drama as the audience called and called. It had barely been silent for a handful of seconds before the nearly choreographed encore call went up. It was less than a minute before the band returned and they thanked the crowd, starting the beginning of a heartfelt MC. Each member held a brief MC, thanking the fans and enquiring after their welfare before Gak hit the high point of the night, declaring that he loved all their fans. Keiya piped up to say he also loved them and stared meaningfully at Fuma. Fuma laughed and shuffled, before admitting that he, too, loved each and every one of the fans. Keiya continued the MC, thanking everyone who came and saying it was thanks to their support that Purple Stone could play there today. They want to be bigger and better for everyone who supports them. If their fans are there than they can do it with the power leant to them. All they want is to help spread happiness and music together. He then asked if the fans would continue to support them continue to love them, before raising his voice in a crowd-riling shout to start the encore for real. And Dark In[s]anity began. The drums and purple lights started as Keiya ontinued to talk, his voice encouraging the fans to keep going, to raise the roof until the very end. With renewed energy, the fans launched into punching the air, before Keiya began a call and respond. The pink and purple lights flashed to the upbeat song as the sensu began and Keiya called for the crowds to give them more. Fuma joined him, and everyone began to jump during the responses, before falling into wide and enthusiastic sensus. With an English ‘alright, let’s go’ Keiya began the round of oritatami as Gak and Fuma played with vigor, sunk low into their stances, feeling the music. Then in sync, all members began to jump in time with the fans, before Keiya thanked the crowds again and the lights went black, punctuated by bursts of red, heralding the very final song in Purple Stone’s Tokyo oneman. They ended on Negai, one of their title songs as Purple Stone, a rock song with elements of a powerful melody and meaningful lyrics. The strobes kicked in with the guitar and everyone began to clap as the guitar fell silent for Keiya’s voice to weave with the bass and drums. It was quiet, intense, with an essence of tribal war drums, building the tension until the end. Then with an explosion of guitar, the song leapt into action, as Keiya sang for his wishes to guide him down the right path. Gak and Fuma began to jump with the fans, as Keiya leant far out over the bars. Then the lights went dark, broken only by the purple wrist lights and purple strobes. Fuma clapped as Gak continued to play, Keiya’s voice above it all thanking the crowd, telling them he loved them, before demanding that they scream. Everything returned in a rush of force, the wavering guitar, the war drums, the eternal bass, as Keiya waited, his arms wide as the fans finished up their oritatami. Keiya’s emotion was clear in his face and voice as he sang that he would show the crowds his soul, launching into the final round of jumping to the drums beat. Then there was nothing left but steady white lights and the upraised arms of the silent crowd showing their unwavering support for Purple Stone. With a final ‘We are Purple Stone. Thank-you’, Keiya waved goodbye, bowing his head with the emotion as Gak and Fuma moved in towards him, smiling out and waving towards the audience. The final guitars chords faded out into silence, signaling the end to an emotional, exciting first Tokyo oneman for Purple Stone. We can’t wait to see what they have in store for us in the future. Fuma: If I was to die right now, it wouldn’t matter. I wouldn’t care. It was amazing. Gak: Talk about macabre. Does that even translate into English? Fuma: I’m sure it does. But it’s a joke? –english- It’s a Japanese joke. Keiya: I was worried about how it would turn out and I was really nervous before we went on. But it was… amazing. Everyone was out there supporting us, and they were all smiling and glittering so brightly. It was wonderful. Thank-you all so much. Gak: Same here. It was an amazing, wonderful, fun oneman. I love you all. Fuma: Gak loves everyone. –english- ‘I love you all, from Gak’. Gak: At any rate, it’s true. I love you all. Thank-you. Sensu: motions with the hands and arms that make a movement like the spreading of a Japanese sensu fan.